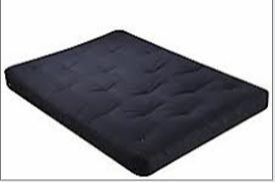 Washington DC 6" thick black futon mattress available in Chair, Twin, Full, Queen, Love/Seat, and Ottoman sizes. Built with fibron cotton batting and 2" fiber foam core. Machine tufted. Available in Twin, full, queen, chair, Ottoman/chair, loveseat, Ottoman/loveseat futon mattress.